I like it a lot, seems to be a bit like Hindi to me... Especially with the sandhi. Very cool. I have two conlangs which are morphologically and grammatically inspired by Latin, Greek and Finnish right now. 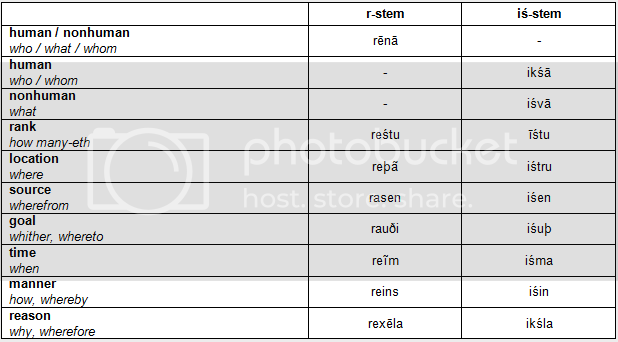 Standard Baranxe'i has two families of interrogative pronouns, the r-stems and the iś-stems. The r-stems are the older group, but dropped out of common use in the late Middle Baranxe'i stage. The change originated in the Central dialects and subsequently spread outwards. Today, the r-stems are only used in Religious Baranxe'i and in Baranxe'i legalese and have been completely supplanted by the iś-stems in all dialects and all colloquial forms of Standard Baranxe'i. While these do not have clitic forms, if they act as determiners, they follow regular stress rules, but as pro-forms, they carry stress on the ultimate sillable. ikśin alē’in varānet? - Religious Baranxe’i: rēnin alēn varaunīt? Which man did you see? ikśā iśvun iśma iśtru iśin atmanes? - Legalese rēnā rēnun reim reþã reins atmanes? Who does what when where how? The proximal demonstrative þinā in this case follows the head as a regular adjective, whereas ha’inā introduces the actual relative clause. þinā thus completely agrees with the head in the main clause, whereas ha’inā only agrees in gender and number with the head in the main clause, but it takes the case needed in the relative clause. If the head has the same case in both the main and the relative clause, þinā can be dropped. The man who saw you yesterday saw me today. I saw the man whom you saw yesterday today. I saw the man who saw you yesterday today. This lang is full of WIN! Other less tidy than suspected forms are due to sandhi, replacement of purely agglutinating forms with inherited fused forms, and a person/number switch in some of the dual forms. The reason is historical: most of these verbs originally had a root ending in a syllabic liquid (for the examples here, *bʰr̩-, *bʰl̩-, *ŋl̩-) and took an epenthetic consonant (varying in dialects, but -n- in Central ones) to form the infinitive and when adding vocalic endings (so, *bʰr̩nā, *bʰl̩nā, *ŋl̩nā, 1.SG.ACT.IND *bʰr̩nem, *bʰl̩nem, *ŋl̩nem, bu 1.PL.ACT.IND bʰr̩mjā, bʰl̩mjā, ŋl̩mjā). When the syllabic liquids shifted from *r̩ l̩ > ar, al, the epenthetic consonant disappeared in most parts of the declension, but remained in the infinitive. Most of these verbs are very common, however, and the phenomenon hence spread to other verbs ending in -na, although the form with -n- is the prescriptively preferred one (e.g., sepna to build, sepnem, sepem I build; ruxna to flow, ruxno, ruxo it flows). Conversely, the -na infinitive has also spread to some verbs which originally didn't have it (e.g., rura, rurna to run, rurem, *rurnem I run). The present, which is unmarked. It is essentially the non-past tense. nikabunar draimo. - The window breaks. nikabunarn balbem. - I break the window. kiþantijamē, hpaizē̃n nimvem. - In the early morning, I need tea. 1996-mē’āmur baranxiźu meidrem. - I've been living in Baranxiź since 1996. The past, marked by -ān-, which is used for events and actions that took place in the past and have finished in the present. þaðú ðumarīn varānem. - I saw you yesterday. źvaðuþamē, rotānem ā minruham draimāno. - Last week, I fell and broke my leg (≈ my leg broke). 1996-mē baranxiźu meidrānem. - In 1996, I was living in Baranxiź. The future, marked by -is-, which is used for future events and actions. It is slowly being replaced by the present in spoken Baranxe'i for most futures and is reserved for the far future alone. Aside for Religious Baranxe'i: it still uses the full set of tenses from Old Baranxe'i, which include a pluperfect āt, a mythological past akan, a future past isn, and a mythological future isar. Most of them died out in spoken Middle Baranxe'i; a modern Baranxe'i speaker will recognize the mythological past as a literary past from religious texts, but using it (not to mention the more obscure tenses) in everyday speech is regarded as incredibly pompous. Or creepily pious. The Baranxe'i voices are not much more difficult, either. ðumarīn varem. - I see you. ðumarīn varānem. - I saw you. ðumarīn varisem. - I will see you. The passive is marked by -k-. Historical aside: This was originally a collective marker for nouns, which then acquired a passive meaning and ultimately was adapted to the verbal paradigm. The mixed collective/passive meaning can still be seen in some nouns, such as kakśu cooking things > cooked things > food, ŋalku wish things > wished for thing(s) > wish, valku 'knowledge stuff' > known things > fact. Religious Baranxe'i, however, uses the older passive marker -ain-, which makes the passive almost incomprehensible to modern Baranxe'i speakers. One of the motivitations for adapting the -k- marker for verbs was that -ain- in an unstressed position led to confusion with the unstressed past marker -ān- and/or the participle marker -an-. The past passive participle ends in -ānainanā in Religious Baranxe'i, modern Baranxe'i has -āŋanā instead. varna: ðumarīs varkempa / varāŋempa / varikśempa. - I am seen/was seen/will be seen by you. nimva: hpaizen nimukokś / nimvāŋokś / nimvikśokś. - Tea is needed / was needed / will be needed. navēsa: ðīni navēkśeġa / navēsāŋeġa / navēsikśeġa. - My brother is (being) surprised / was surprised / will be surprised. The most common mood in Baranxe'i is the indicative. The subjunctive is mainly used to express wishes, hopes, or to mark reported speech. varem / varānem / varisem. - I see / saw / will see. varkempa / varāŋempa / varikśempa. - I am (being) seen / was seen / will be seen. navēset / navēsānet / navēsiset. - You surprise / surprised / will surprise. navēkśetsa / navēsāŋetsa / navēsikśetsa. - You are (being) surprised / were (being) surprised / will be surprised. nimvos / nimvānos / nimvisos. - It needs / needed / will need. nimukokś / nimvāŋokś / nimvikśokś. - It is needed / was needed / will be needed. þilem ēþ varjēh / varāñēh / variśēh. - I hope that I see / saw / will see. þilem ēþ varxēŋ / varāŋjēŋ / varikśēŋ. - I hope that I am (being) seen / was seen / will be seen. ŋalem ēþ navēśēþ / navēsāñēþ / navēsiśēþ. - I want that you surprise / surprised / will surprise. ŋalem ēþ navēkśēþk / navēsāŋjēþk / navēsikśēþk. - I want that you are (being) surprised / were (being) surprised / will be surprised. hēves ēþ nimujus / nimvāñus / nimviśus. - S/he said that it needs / needed / will need. hēves ēþ nimuxukś / nimvāŋjukś / nimvikśukś. - S/he said that it is needed / was needed / will be needed. The imperative is not marked as a mood per se. Instead, it uses a verb-initial phrase, with the verb ending in -e/-eju/-eja. Gender in verbs is most commonly marked as animate vs inanimate. The verb has to agree with its subject in number. However, a consistent singular/dual/plural distinction is only made for animates; all inanimates take verbs in the singular. The dual is marked by in the indicative by -ī- before the personal ending. This either leads to a hiatus between the gender marking vowel and the dual marker, or the gender marker is elided. The 1st person, which is generally marked by a nasal of some form. The 2nd person, which is marked by a dental consonant. The 3rd person present, which is unmarked. The 3rd person absent, which is marked by s.
And that's pretty much it for the conjugation of verbs, which leaves the participles, periphrastic constructions, auxiliaries, and probably a slew of other verb-related stuff I can't think of right now. How did the passive vs. active distinction develop in the personal endings? It was the original way of marking active/passive; the double marking evolved the same way as that of the subjunctive (so older varempa > modern varkempa via participle varkane). If you mean how the exact form of the endings evolved... well, to be honest, I'm still working on that. The subjunctive passive endings and the 3.SG.ABSENT in the indicative passive, however, are the result of a further 'k creep' from the stem passive marker k into the passive endings. I should logically continue with verb stuff, but I feel uninspired, so let's jump to ADPOSITIONS! 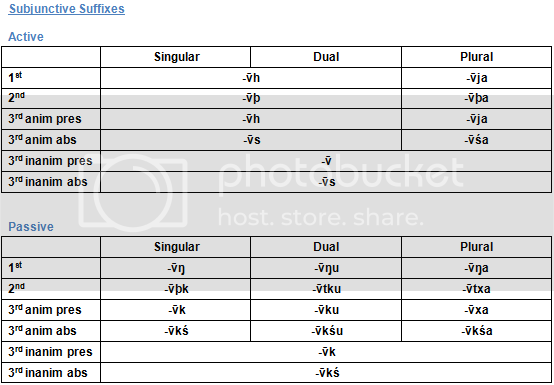 Baranxe'i has both prepositions and postpositions, and even a handful of circumpositions. Some Baranxe'i regiolects and dialects make a much greater use of the latter. The most basic type of adpositions are the movement prepositions and the location postpositions. The same adpositions functions as a movement indicator as a preposition and a location indicator as a postposition. > nikaub xõ sereinem - I walk [up and down] inside the house. > xõ nikaub sereinem - I walk into the house. > Xõ źuf þajalem. - I travel to the city. > Źuf xõ kśauxþa roja rata. - There's a big market in the city. > Sen medur sereinem. - I walk out of the room. > Medurham sen vaurem. - I eat outside my room. > Xan ēk xansem. - I climb onto the roof. > Ēk xan jaŋem. - I'm sitting on the roof. > Īl gāf mevārēmat. - I hide under the table (= I move under the table in order to hide). > Gāf īl kiþmajuja usñeja. - The kittens are playing under the table. > Āmur īpalaf rurem. - I'm running away from the woods. > Īpalaf āmur śnikab rato. - The temple is [far] away from the woods. > Uði tuzif sereinem. - I'm walking towards the harbour. > Tuzif uði faurānemzan. - I waited for her at the harbour. > Ŋalþ mafþu rotānem. - I fell in front of your mother (= I fell into her path). > Mafþu ŋalþ rotānem. - I fell down in front of your mother. Two of these adpositions can also take on a temporal meaning. Standard Baranxe'i demands the temporal case, but many regiolects/dialects use the adpositional there, as well. > Aś śaup haðēŋo. - It flew behind the building. > Śaup aś ratem. - I'm standing behind the building. > [Aś aśruz]/[Aś aśruzmē] valānemzan. - I met him after the end. > Ñaś sīljuf zondānem. - I jumped in front of the car. > Sīljuf ñaś zondānem. - I jumped [up and down] in front of the car. > [Ñaś sauf]/[Ñaś saumē] tśamāneña. - We drank before the party. > Rēn hētanif xaśtānis. - He entered, preceding the king. > Hētanif rēn xaśtānis. - He entered with the king. > Hīr ðumarif hēvāneña. - We talked about you. > Ŋalfaþ hīr ratānem. - I stood/leant against the wall. > Ðeir ðumarif hēvāneña. - We talked about you. > Xaŋśe xanpritēf rurānem. - I ran across the bridge. I walk inside the house. 'I walk to inside the house' = I walk into the house. These adpositions are also used as prefixes for both verbs and nouns. By far the most productive among them are xan and īl, and xõ(ŋ). aś has many verbal and nominal derivations, but many of them have experienced semantic drift and are not that transparent anymore. The basic motion verb derived from aś was *ácʰca (~ [ˈɑtʰːa]) in pre-OB. which all have the semantic field to hunt; to track; to follow. Other adpositions are mostly derived from verbs. They are almost all postpositions, although a preposition slot is accepted for some of them if they clearly refer to movement. Some of the more recent derivations often have parallel forms with both the adpositional, or their original case. > Lēim aimif leimnú ha ēgu. - The thread around the finger is red. > Śaup leimnú (leimnú śaup) sereinem. - I walk around the building. > Somajaun/Somajãn varanú a’i vaþigrānem mē. - I haven't yet come to a decision regarding my wife. And that's all standard adpositions I have so far. One huge regional difference is the treatment of the pre/postposition difference. Not all use solely the type of adposition to discern between movement and position. I killed him with a dagger. Negation in Baranxe’i uses the construction a’i X mē. Phonologically, a’i is a separate word [ˈɑ(ː)ʔɪ], whereas mē is usually a clitic [mɛ], unless the negation is stressed. This stress is not marked in writing, however. I did not hit her. Uði Baranxiźu a’i þajalānem mē. I didn’t go to Baranxiź. A’i āraþe mē mismaf xõ. Don’t dance in the rice field. A’i taiþem mē ēþ somas-mautanzi śanihþus hīvarānīh. I don’t think he killed his mother-in-law with a hatchet. Taiþem ēþ somas-mautanzi śanihþus a’i hīvarānīh mē. I think he didn't kill his mother-in-law with a hatchet (but maybe he was the one who chopped her body up). A’i uði Baranxiźu mē þajalānem (rausa uði Kītīlē). I didn’t go to Baranxiź (but to Kītīlē). Āraþē a’i mismaf xõ (rausa ilēkmaf xõ). Don’t dance in the rice field (but in the wheat field). Taiþem ēþ somas-mautanzi a’i śanihþus mē hīvarānīh (rausa laipdīsar). I think he didn't kill his mother-in-law with a hatchet (but by strangulation). mē also forms the basis of negative derivation in Baranxe'i; as a derivative affix it prefixes the negated part of speech; however, this is barely productive anymore most existing examples are inherited terms (such as, mevrēnā unseen, hidden from pre-Old Baranxe'i mē-bʰr̩̄́jāine being made unseen) or are educated formations (such as, mēda'inanā inanimate (in linguistics)). More productively, adjectives use -nim- to indicate lack or opposite quality. It is related to nimva lack, need sth. and nīma remove. The variation between s and v is due to the co-existance of the inherited verb nimva to lack and the productive verbaliser -s-. There's a similar co-existance of adjectives being zero-derived into nouns, or taking the agent suffix -ēn. Very cool conlang you have here. Just this second page has been an interesting read; I look forward to what awaits me on page 1. Good job. Pretty rare that I say this, but: that's some pretty awesome conlanging going on there. I'm loving the vaguely-but-not-too Indo-Europeanish feel you've got going on there, and I particularly like the verbal system. This is an area where my descriptive talents fail me a bit, so tell me if it doesn't make any sense. 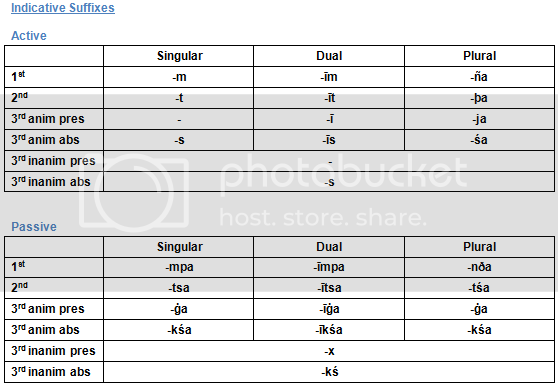 Baranxe'i technically has two causative systems; and older, inherited and unproductive one featuring vowel augmentation and a productive one with the suffix -Vjat- (that is, it's -ijat- if the last vowel in the stem is a front vowel, and -ajat- if it's a back vowel). The causative increases the valency of a verb by 1, thus turning intransitive verbs into transitive ones and enabling the latter to take a double accusative. In its semantic function, it covers both direct action and coercion - the former is the fundamental meaning of causatives derived from adjectives. Adjectives can take the verbaliser -s- (Baranxe'i is in the middle of a shift away from using the copula at all), leaving a choice between deriving the causative directly from the adjective or from the verb. Milk is healthy for you. The wise woman healed his leg. I give money to the woman. I make the man give money to the woman. The dog bites the man. The man makes the dog bite the man. The man makes the man bite the dog. Alē’in īnan ruvũr sundźir juŋajatajatānem. I made the man make the woman give money to the boy. I made the wise man heal your leg. In theory, there is no limit to this, but in practice, it loses its usefulness after two or three.